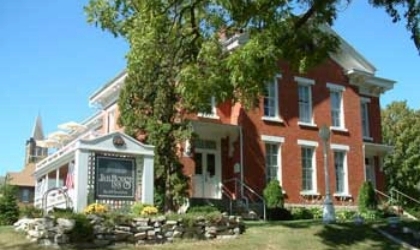 The JailHouse Inn is the Old Fillmore County Jail built in the Italianate architectural style in 1869. 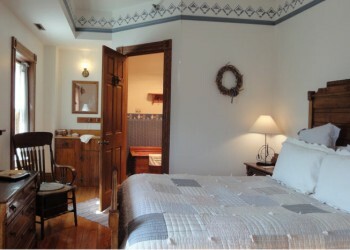 The interior of the Inn has painstakingly been restored to its original Victorian splendor. Many aspects of the interior space have been left as they may have been, including the original curved walnut banister at the front entrance of the Inn. Some of the original seven foot paneled white doors remain from when the purpose of the building was the Fillmore County Jail in Preston, Minnesota. Today, the JailHouse Inn is listed on the National Register of Historic Places. If the walls could talk, you might hear many an interesting tale, such as the story of the prisoners who chiseled their way to freedom with their dinner spoons. Today, couples are married here in the Inn, renewing marriage vows in our peaceful setting or simply unwinding from the fast pace of everyday life to enjoy the peace and quiet our "jail" provides to present day guests. 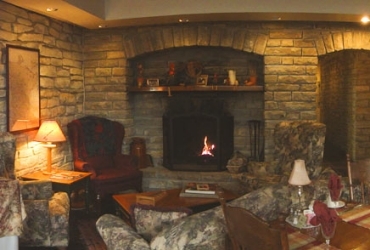 Group retreats and family reunions are often held here in the Inn. Standard queen or king accommodations sleep up to twenty-six with twin and queen sleepers providing space for up to thirty (30). Our dining/meeting room accommodates up to forty (40) persons. The Inn has a room, the "Cell Block" where guests may choose to sleep behind bars just as prisoners once reposed, or the Sheriff's personal bedroom, the "Master Bedroom" may be the choice. The Court room, Bridal Suite and the Cell Block have two person whirlpools to luxuriate in after a day of biking, hiking, fishing or just plain relaxing in the slower pace our rural bluff country has to offer our visitors. For those more romantic moments, the Bridal Suite, Master Bedroom, Processing Room, Oriental Room, Parlor and Dining Room have wood burning fireplaces for guests to enjoy the serenity of a crackling fire.